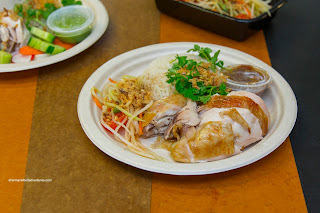 As explained, I had both the Khao Man Gai and Rotisserie Chicken. 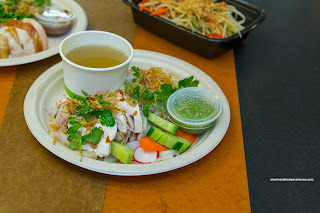 Accompanied by the usual chicken rice, soup and ginger/scallion condiment, there seemed to be something missing. No, everything was there including a good amount of aromatic and crispy fried shallots and pungent cilantro. However, the chicken itself was rather lifeless and not succulent. Even the skin wasn't doing it for me. Maybe it had something to do with the fact I made a similar dish at home the night before. I'm not suggesting that my cooking skills are remotely close to that of Chef An, but I liked my version more. As much as the rice was nutty and nicely seasoned, it was too dry in my opinion. I know this is not a good comparison (as it is not the same city), but the one in Portland is way better. I actually thought the Rotisserie Chicken was more on point as the meat was indeed succulent and fairly flavourful (in a non-salty, but natural-tasting manner). This was probably due to the marinade that included fish sauce, palm sugar and coconut milk.The accompanying Nam Jim Jaew (fish sauce, tamarind, chili) was tasty though with a savoury sweetness, spice and zing that would probably be better than the ginger scallion condiment with the Khao Man Gai. If I had only tried this chicken and not the other, I would've gone home happy. But well, one must try both right? 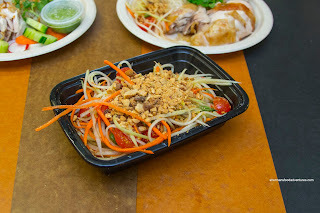 I also got the Green Papaya Salad featuring a mix of julienned papaya, carrot, green beans, tomatoes, peanuts and chilis. I found the crunch to be good while there was a balance between the sweetness and spice while not being too weak on the heat. This was also a fairly large portion, so it would best to share this. I guess it is pretty obvious I liked only the Rotisserie Chicken as well as the salad. 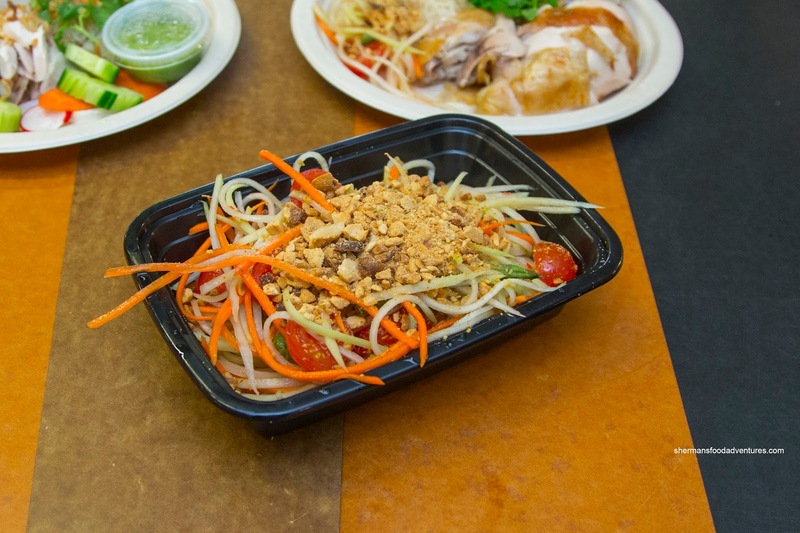 This is significant because the menu only consists of 2 real main dishes. Still worth checking out if you are in the market though. Interesting. In Penny and Rusty's review, they found it to be just the opposite, preferring the more tender Khao Man Gai over the rather dry rotisserie chicken. 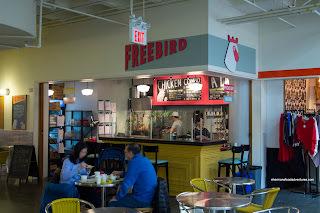 It sounds as if Freebird may be having some consistency issues?